The Coyotes have been seeing the impact of being, how can I say this; terrible would be the word, and building through the draft. The last few seasons saw an influx of rookies joining and having large impacts on the team. In 2016-17 we saw Christian Dvorak, Jakob Chychrun and Lawson Crouse spend the season in the NHL along with Brendan Perlini joining the team after a dominating stint in the AHL. This coming season will also see another impactful group of rookies as Clayton Keller, Dylan Strome and Christian Fischer are expected to make the team along with several other rookies who could push their way into the lineup through call-ups as the year goes along. With the Coyotes trading for veterans Derek Stepan, Niklas Hjalmarsson and upcoming goalie Antti Raanta this summer along with the youngsters taking the next step in their development, Arizona shouldn’t be cellar dwellers too much longer. Most of the rookies that have made impacts on the Coyotes have been first or second-rounders and that’s a good thing to see, as in the past former top picks like Brandon Gormley, Mark Visentin and Henrik Samuelsson didn’t develop as hoped. But their drafting outside of the first two rounds has been weak as the only player in the NHL not taken by the Coyotes in the first or second round since 2009 is back-up goalie Louis Domingue. The Coyotes have stockpiled picks lately and hope to see that trend change as they are deep prospect wise at every position. From BU to USA at the World Junior and Championships, Keller was impressive in all of them last season. He even showed well in a short stint with the Coyotes at the end of 2016-17 season. The biggest question mark heading into 2017-18 is not will he play for the Coyotes but what position will Keller play with the team. Dave Tippett envisioned Keller more as a winger due to his size, probably at left wing but possibly on the right side where the Coyotes are especially thin. With Rick Tocchet at the helm now could we see Keller back at center? Also with the coaching change expect to see Keller receive more playing time off the bat, Tippett tended to lean on his veterans more and bring rookies along slowly. Not only should Keller be taken high in dynasty leagues but even in re-draft leagues he should be targeted as a mid to late round pick. He’ll compete for the Calder and it wouldn’t surprise me at all to see him lead the Coyotes in scoring this season. The Coyotes second of two 2015 first-rounders has slipped under the radar coming into his first season of pro. He missed a good portion of 2015-16 with a torn ACL and started off slow last season coming back from it. But Merkley came on as the year progressed and had an excellent development camp with the Coyotes this summer. I’m betting he spends a good portion of this coming season in the AHL, but it’s probably sooner rather than later we see him in a Coyotes sweater, especially being a right winger where the Yotes are thin position wise right now. Somewhat of an unheralded prospect, Smereck has been impressive with every viewing. He’s had two straight strong development camps with the Coyotes and scored two points in as many games in a short stint with Arizona’s AHL affiliate last season. I don’t think he’ll be the next coming of Erik Karlsson or anything but he could push himself onto the Coyotes on a bottom pairing role for them on defense. On a side note you probably don’t care about I recently grabbed him as a late pick in our Dobber Prospects Fantasy Hockey League draft. In between…what? Well it was hard to classify Wood. On one hand, I wanted to put him in “risers” as he had an outstanding offensive season in the AHL last year. A 6-5, right-shooting defenseman with a rocket shot, on paper he looks like a future stud. But on the other hand, his skating is not good, and I almost put him in “fallers” because if it doesn’t improve Wood won’t last in the NHL. The Coyotes planned on having him spend most of the offseason working with their skating coach Dawn Braid. While it’s unrealistic to expect to see a huge improvement in Wood’s skating in just one summer, just even a small amount better could see him possibly earn a spot on the Coyotes blueline. There is an opportunity on the right side that could be earned over Adam “six NHL teams now and counting” Clendening. I still think Strome is an excellent prospect and will most definitely play in the NHL for a long time. I commend the Coyotes for not rushing him, recognizing he wasn’t physically ready for the NHL last season and sending him back to juniors. Also, recognition on Strome for going back to the OHL, not sulking at all and putting up another dominating season. But many people, myself included, expected Strome to be a full-time NHLer by this point. It’s probably a good chance he either starts or at some point plays in the AHL this coming season. If you have him in dynasty leagues don’t give up on him yet, but the wait is going to be longer than you most likely envisioned. The struggle was real for the two-time CHL scoring champ as his first season of pro would be classified as disappointing. The biggest problem would seem to be size. Listed at 5-8 and 163 pounds, if you’ve ever seen him play those measurements seem generous at best. But everybody likes to cheer for the little guy and Garland did put up seven points in his final 12 games, so here’s hoping for a better 2017-18 season from the offensive wizard. Remember when it was thrown around that Moroz could possibly be the next Milan Lucic. Well after two and half unceremonious season’s in the Oilers organization he was traded to the Coyotes for another disappointing prospect in Henrik Samuelsson. He didn’t impress with Arizona’s AHL affiliate either and with his entry-level contract over, wasn’t given a qualifying offer by the Coyotes and is now an unrestricted free agent. If you still have him on your farm in dynasty leagues it’s probably time to cut lose. I graduated Dvorak, Chychrun and Crouse from prospects, as they officially proved they are NHLers at this point, so that’s why they are not on this list. I was close to graduating Perlini but since he did spend some time in the AHL last year, I left him as a prospect, even though going into this season he is expected to have a top-six role with the Coyotes. 1. Clayton Keller: One of the best prospects, if not the best, in the league. Future top scorer. 2. Dylan Strome: Was number one last season and if Dvorak and Chychrun were still prospects they possible would be rated over him too. Huge potential still there though, it’s just taking longer than anticipated. NHL arrival: This season but could see some time in the AHL. 3. Brendan Perlini: Scored 28 goals in 74 games between the AHL and NHL last season. Expected to have a top-six role with the Coyotes in 2017-18 and very well should score 20 goals with the team. 4. Christian Fischer: A power forward in the making, had some stints with the Coyotes last season and should be full-time in 2017-18. 5. Pierre-Olivier Joseph: The 2017 first-round pick has a ton of potential and was very impressive at Coyotes development camp. Needs to bulk up though. 6. Kyle Wood: A 6-5, right-shooting defenseman with a rocket of a shot, skating the only thing holding him back from being in the NHL. 7. Nick Merkley: Returning from a torn ACL, he came on as the season progressed. The 2015 first-round pick is an excellent playmaker and plays an agitating game demonstrated by his 73 penalty minutes in 2016-17. NHL arrival: Could push for a spot with the Coyotes thin on right wing but most likely in 2018-19 after gaining some pro experience. 8. Adin Hill: The Coyotes hope for “goalie of the future”, started 2016-17 like gangbusters but struggled second half of the season. 9. Cam Dineen: Offensive defenseman missed most of 2016-17 with a torn MCL after taking a knee-on-knee hit. Looked good in Coyotes development camp and should have a strong final season of junior. 10. Kyle Capobianco: Another unheralded defenseman prospect of the Coyotes, Capobianco was very consistent in the OHL playing a quick transition game. Should be interesting to see him play in the AHL this coming season. Arizona’s rookies will report for rookie camp at Gila River Arena on September 7th for medicals and fitness testing followed by an on-ice practice on the 8th before traveling to San Jose. In San Jose they will compete in a tournament against rookie squads from the Sharks, Anaheim and Colorado. Thanks for reading and I hope you enjoy the rest of your summer. If you feel inclined check out my Pulitzer Prize winning 31 in 31 Coyotes from July. Or check out the other teams from maybe not as good as me but still excellent writers at Dobber Prospects here. 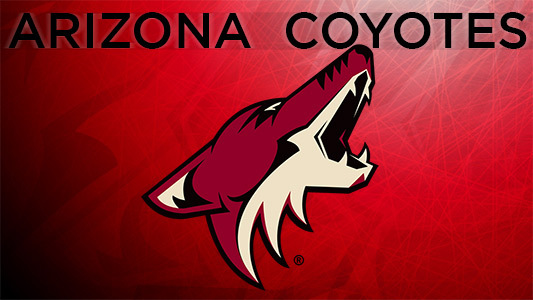 To hear or I guess read, my views on Coyotes prospects and other mostly hockey related things, follow me on Twitter @KDuggan92. Also take deep breaths and remember: Hockey season is almost here!